Backup your database to avoid being lost all files and data when the nasty happens. If you have customized your site, please save these codes. It can help you restore the previous version in case you aren’t satisfied with the new design. From FreelanceEngine 1.8, all payment gateway extensions of FreelanceEngine are separated from AE extensions family. So, you must deactivate the old plugins including AE Pin, AE PayUMoney, AE PayFast, AE MOLPay, AE Paymill, and AE SagePay. Then, go to your member area to download and install new plugins such as FrE Pin, FrE PayUMoney, FrE PayFast, FrE MOLPay, FrE Paymill, and FrE SagePay instead. Visual Composer, Slider Revolution, and WPML plugins aren’t supported from this version. So, you should deactivate these plugins. 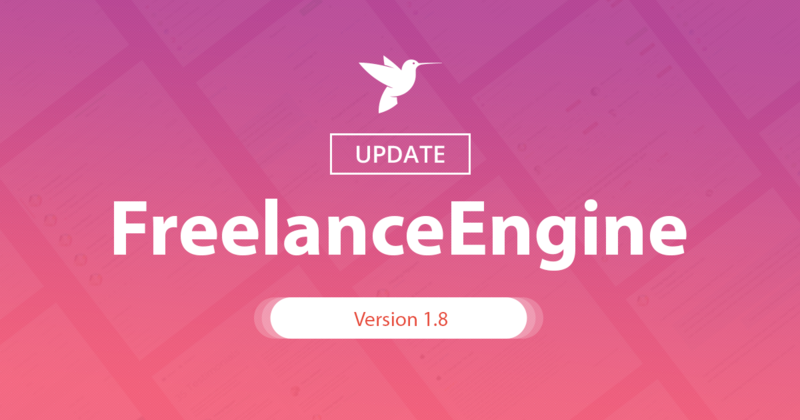 As we promised in our sneak peek 3 weeks ago, today we’re here to announce you that FreelanceEngine 1.8 is officially released with the new design. We hope you will love the new appearance of FreelanceEngine and find it cleaner and more intuitive to use. We’re planning to develop FreelanceEngine with more improvements and functions such as multi-freelancers for a project, geo-location, or new package purchase. However, it’s really hard for us to implement these features based on the current design. Besides, the UX/UI design of FreelanceEngine is outdated. So, the theme design needs adjusting to be not only more modern but also easy for us to conduct more features in the future. In other words, FreelanceEngine 1.8 is the first step in the process of developing our theme later. When your site is upgraded to FreelanceEngine 1.8, you will certainly get a bit surprised since we redesigned the whole theme, including homepage and other pages such as project listing, profile listing, and project detail pages. Notification and login pages are also added in this version. One of the most remarkable changes in this version is the new homepage layout. With this design, we focus more on UI elements. That’s why we change the whole homepage structure and color. Besides, we redesign the homepage with the new appearance, so Slider Revolution and Visual Composer plugins aren’t supported from this version. 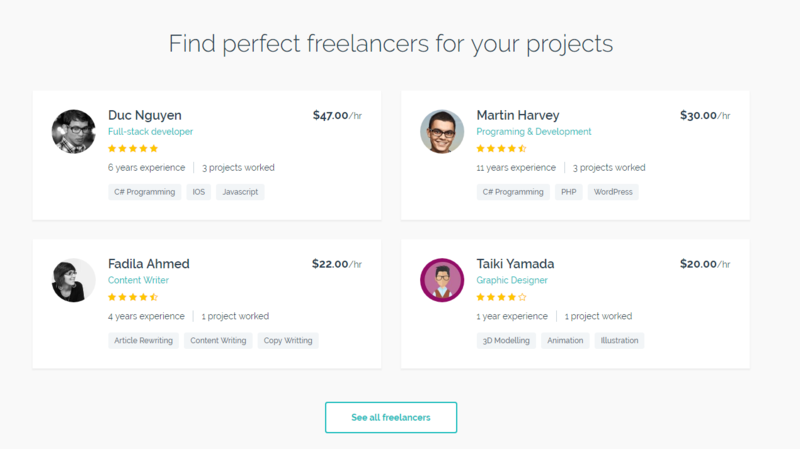 From now on, freelancers or employers on your site can easily search for projects or freelancers by keyword. The box search is located on the header menu. 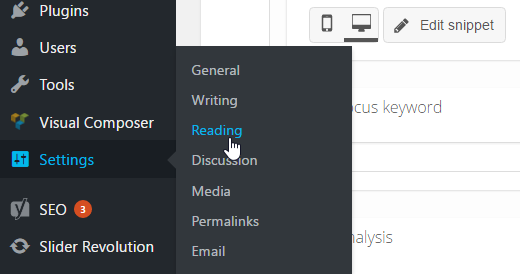 Header menu is fixed, according to user’s role. If you want to add more pages in the header menu, you must create the header menu and add many pages as you want. Previously, if you want the slider to display on your homepage, you must use Slider Revolution plugins. However, sometimes you find it inconvenient when integrating this plugin into your site. Thus, in this version, we decided to carry out the block banner, allowing you to add your own banner or ads on your site. 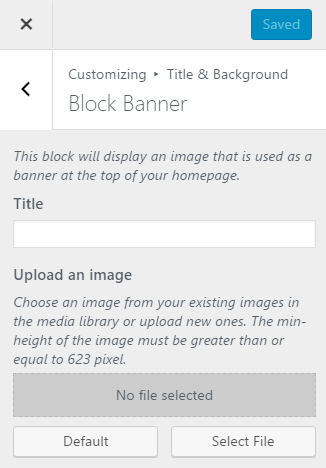 To upload the new image and customize the title text, you just go to Appearance → Customize → Title & Background → Block Banner. Now, you are able to give a quick description of the main workflow on your site, helping users to grasp clearly how your site works. Similar to block banner, please visit Appearance → Customize → Title & Background → Block How to add descriptions and upload icons. There is a minor change in this block. 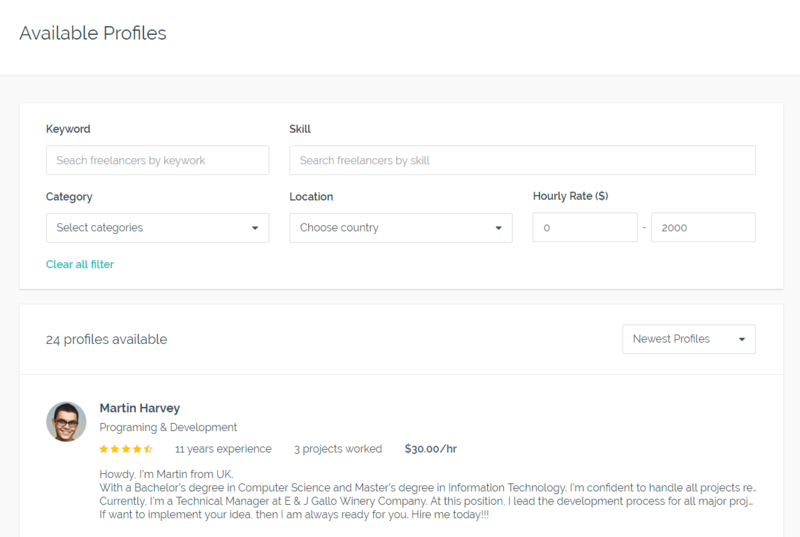 The number of years experience and project worked are seamlessly displayed in the freelancer’s profile. Similar to the previous version, this block will display latest projects. To customize the title of this block, please go to Appearance → Customize → Title & Background → Block Project. This block will display the testimonials of your users, including their story and featured image. 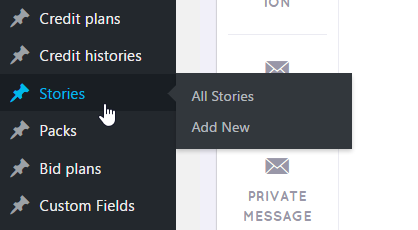 If you want to edit or add a new testimonial, just click on “Stories” section from your admin dashboard. All available package plans will be displayed in this block according to freelancer or employer role. 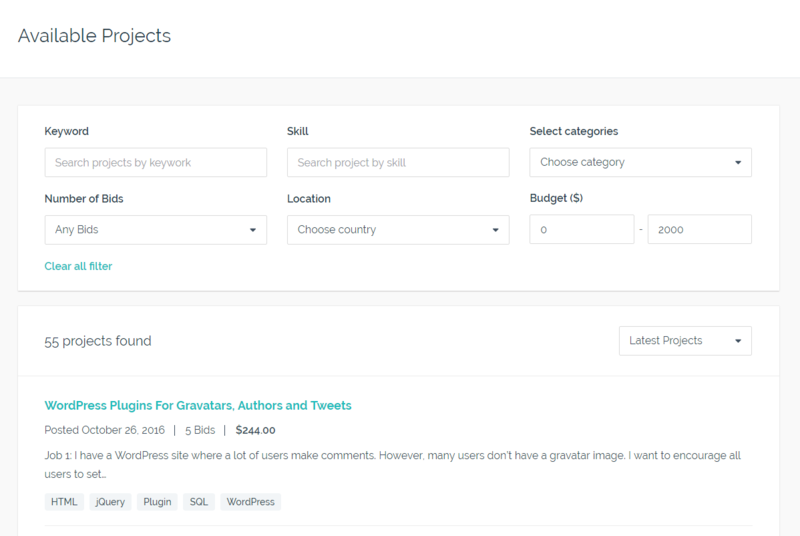 If users are freelancers, bid packages are shown. Otherwise, packages for project posting are displayed. Like other blocks, you can modify the title of this block in the Customize section. With this new homepage layout, we conducted the get started block to help you set up a greeting sentence, displayed according to user’s role. The buttons of this are fixed, but you are able to visit Customize section to edit the greeting text. From this version, when users click on the login link, they will be redirected to the login page instead of seeing the pop up as before. The notification page is also added in this version to store all user’s notification, helping them to easily track and manage the activities related to them. The role of user is distinguished when they create a new account on your site. User can register as either employer or freelancer. 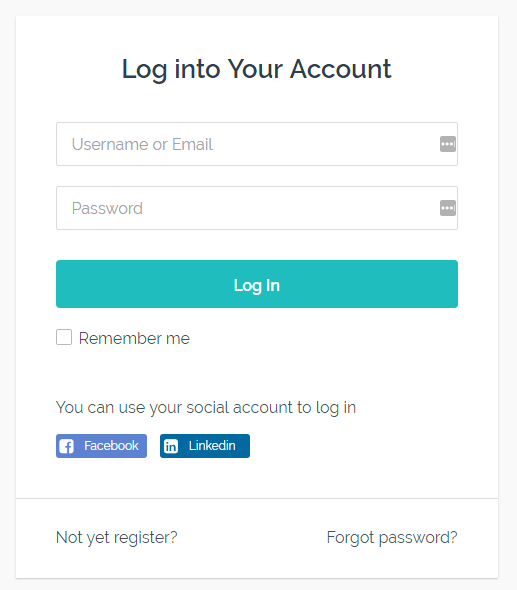 There is no UX change when users sign up by social account. Previously, when posting a project, a visitor would select the package plan before signup or login. But now, a visitor must signup or login in advance. Similar to purchase project posting package, users and freelancers must sign up or log in before selecting the package and proceed the payment. Besides the UI elements, the flow of searching projects is also changed. Filtering by project type is no longer available. Instead, freelancers can search projects by the number of bids and location. Other search functions such as keyword, skill, categories, and budget aren’t modified. Searching by location and hourly rate are added from this version besides keyword, skill, and category. From FreelanceEngine 1.8, we implement the responsive layout for both mobile and tablet display. As a result, we remove the mobile version of FreelanceEngine theme. We’re planning to integrate custom field into our theme, so we remove this extension from this version. If you are using AE Custom Field on your site, you can still use this plugin as usual. However, we won’t develop or update AE Custom Field. Instead, we will carry out the custom field as a function of FreelanceEngine in the future. 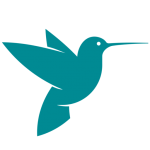 Along with FreelanceEngine 1.8, FrE Escrow Stripe 1.3, FrE Private Message 1.2, FrE Credit 1.2, and FrE Milestone 1.3 are also released to the latest version. Other payment gateway extensions, including FrE Braintree 1.1, FrE MOLPay 1.2, FrE PayFast 1.2, FrE PayUMoney 1.3, FrE Pin 1.1, FrE SagePay 1.2, FrE Stripe 1.4 are updated as well. Many people are properly worried about the customization problem. Because we change the whole UI elements, your customization will be affected. But don’t worry, you are able to select to use either new homepage layout or the old one if you want to keep the customization. However, please note that you can only keep the old homepage, other children pages such as project detail, workspace, user’s profile, freelancers, and projects will be changed must be used by the new design. 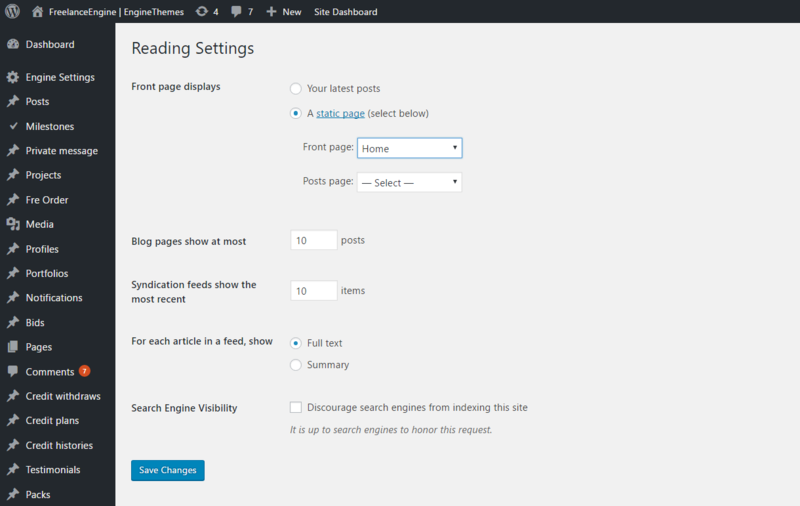 How to keep the old homepage when updating your site to FreelanceEngine 1.8? Tick on “A static page”, then choose the page you want to display as the homepage in the “Front page” field. Don’t forget to click on “Save” to complete the setting. ***Note: Although you can use the old homepage and keep its customization, we recommend you to use our new homepage layout for your site and custom it again as you wish. That’s because we will carry out lots of improvements, and the old design may have some problems. To celebrate the new version of FreelanceEngine 1.8 and show deep gratitude for your support along our journey, we are really happy to give you special gifts with $30 off and $20 off when you purchase the Pro and Plus upgrade package respectively. Check out now to skyrocket your business! 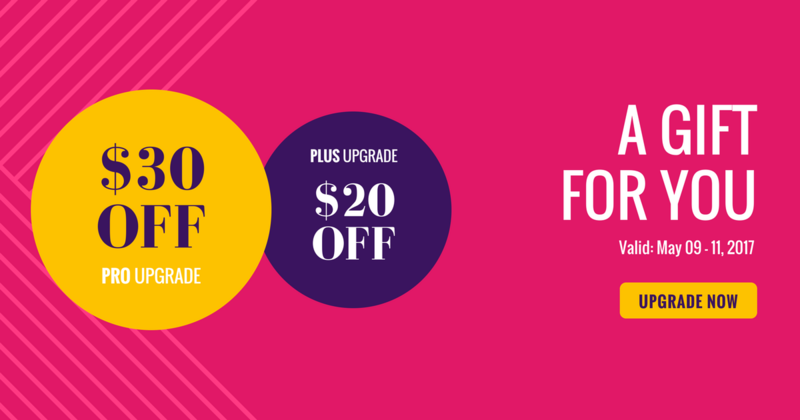 Besides, we also offer you up to 30% off when purchasing the Pro & Plus package. Just enter the coupon code PRO30 for FreelanceEngine Pro Package & PLUS20 for FreelanceEngine Plus package at checkout to get 30% and 20% off respectively. The deal also lasts 3 days (May 09 – 11, 2017). Above are all about FreelanceEngine 1.8. If you have any questions or need any support, please contact support@enginethemes.com. Awesome stuff, busy upgrading. Keep up they great work! First of all, thank you for mantain the theme updated. I will be honest saying that before reading this article, I was thinking why you guys will update the UI/UX instead of updating the theme functions, like the multi-freelancer projects, custom fields, workspace and so on, wich are more important updates and core functions that need improvement. Now, I understand the reason that to this core functions be updated you need to update the interface first. I’ve translated my entire website. Can I update the theme and still get the website translated? I just need to update the theme and select the updated language that I’ve made? Regarding your question, your translated texts will be kept when you upgrading your site to FreelanceEngine 1.8. However, you should check your .po, .mo file and translate some new texts. P/s: We recommend you to back up your database before updating your site to FreelanceEngine 1.8 to avoid being lost all files and data when the nasty happens. about this : We removed the AE Custom Field plug-in from this version and we will carry out the custom field as a function of FreelanceEngine in the future. I’m using this plugin heavily so i can’t start using this new FrE version without it, and in the future i will get problems when there will be new functionality that does the same and my website is not compatible anymore. If i keep using the old version i always get as answer in the support emails that upgrading to the latest version is mandatory otherwise i get no help, so keep using the older FrE version is no option. Regarding your question, AE Custom Fields still works with FreelanceEngine 1.8. So you can update your site to the latest version of FreelanceEngine and use AE Custom Fields as usual. However, we don’t support this extension anymore. It means that we won’t develop this plugin and we are planning to integrate it into our theme as a theme function. As a result, you don’t need to worry about this problem. if you integrate the AE customs field plugin in the theme will the old fields and their content still function ? i got a lot of users and i can’t expect them to fill it all in again. So compatibility is very important, i need to be sure. Regarding your question, if we integrate custom fields into our theme, we’ll try our best to make your old fields and its content not be affected. Or else, our developers will guide you how to keep your data in case of worse situation. To “try our best….” is not enough. What do you think would happen if it is not compatible? ALL DATA WILL BE LOST. And are your developers gonna help hunderds or maybe even thousands of users one by one who also use this plugin? This is not a solution and since my old version is not supported anymore we need to know in the short term how you are going to solve this very HUGE PROBLEM. What will succeed to Visual Composer? What editor should we use to create new pages? Regarding your question, you can test any editor used to create new pages. However, you should back up your database in advance to avoid being lost all files and data when the nasty happens. where can be problem hidden? Regarding the issue, kindly send us a ticket by choosing the “Technical Problems” at https://www.enginethemes.com/help/ with specific details or screenshots of your mentioned problem. Our TS will help you solve the issue. I bought 1.7 a few months back. Do I have to pay for upgrade? Hi Am, you don’t have to pay any money for the upgrade. 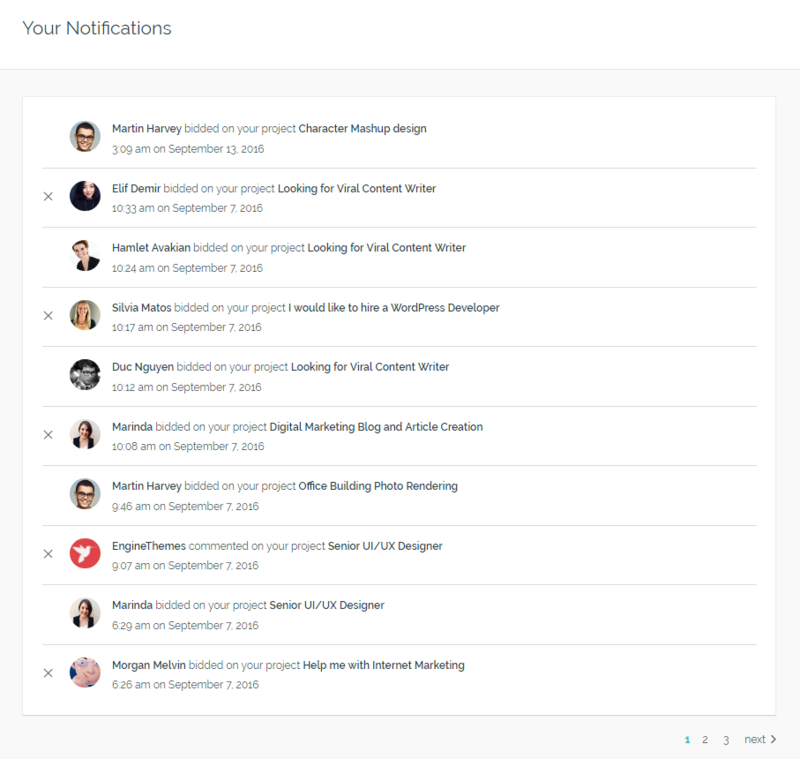 If you add your license on Enginethemes.com, a notification message will be shown in your WordPress dashboard whenever our themes are released a new version. I hope this tutorial can help you: http://docs.enginethemes.com/article/469-updating-the-latest-version. Hi, first of all really nice work you guys! I’d like to know why there is no “Invite me to join” button when you look at freelancer’s profile page as a visitor, but there is a “Bid” button, if you check the project’s page as a visitor, re-directing you to the sign-up page? I think there should be “Invited me to join” button on the freelancer’s profile page as well, because this is a natural call to action for an employer who is not yet registered. If this is not something you can implement right now is there a way to do this myself by customizing the code? 1. I’d like to know why there is no “Invite me to join” button when you look at freelancer’s profile page as a visitor? -> Because a visitor isn’t the employer, he cannot invite the freelancer to bid on the project. Only employer can invite freelancer to join his project. That’s why only employers can see the “Invite me to join” when they look at freelancer’s profile page. 2. There is a “Bid” button, if you check the project’s page as a visitor, re-directing you to the sign-up page? 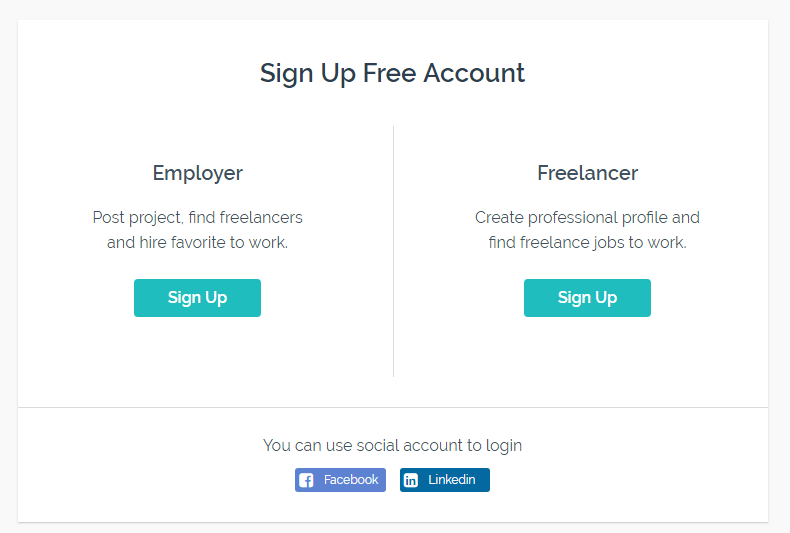 -> In FreelanceEngine website, visitors must register as a member (freelancer/employer) before taking any actions such as post a project or bid on a project. That’s why visitors are redirected to the signup page when clicking on the “Bid” button. 3. If this is not something you can implement right now is there a way to do this myself by customizing the code? -> Yes, you can hire a developer/freelancer to implement whatever functions you want based on FreelanceEngine theme. In the header menu I cannot see the sign up link… What I should to do for activate it? Great theme!!. What is the different between escrow feature and escrow stripe plugin? Regarding your question, Escrow system is a neutral third party in the transaction holding the money so that it won’t reach the other party until the service or good is delivered. Escrow system is currently working with PayPal Adaptive, Stripe Connection, and Credit. However, only PayPal Adaptive payment gateway is available when you purchase FreelanceEngine basic. If you want your employer to check out via Stripe payment gateway when accepting a bid, you must purchase the Escrow Stripe extension. updated theme and got this error. http://prntscr.com/f650lc. submitted two tickets about this issue. also branding seems to be missing too. Since lots of tickets are sent a few days ago, your ticket is resolved later than usual. I’ll forward your request and ask our TS to resolve your problem ASAP. Again, sorry for any inconveniences caused. Regarding your question, the “featured project” isn’t support from FreelanceEngine 1.7.11. You can read our blog post for further details at https://www.enginethemes.com/update-freelanceengine-1-7-11/. Will this feature ever come back? I think it’s a very necessary part of the website. Why would employer pay for a project that looks the same as free project? Why not just create a new account? Featured Projects are a must. EVERY website has it. The featured post function is still in our ideas. However, you can log into your Trello account & vote for this feature at https://trello.com/b/YYOQhHD5/freelanceengine-fre-roadmap-2017. We’ll give priority to those which have the highest votes. Hello, I’ve submitted 3 technical help tickets this week but so far haven’t heard back. I’ve upgraded the theme on my site, and also pilot 1.8 on my backup servers. I do realize quite some buggy behaviors. For instance, after upgrade, a lot of links just become dead. A very obvious one is that the LOGIN points to the Home URL ( displays my Homepage URL). Also on my clean backup server installations, with a clean installation of 1.8, after the Employer submits a post, this post doesn’t show up under his “Profile”. I tried this on 3 backup servers, with the same installation and identical environment, 2 of them have the issue while the 3rd one works (i.e. the poster can see the new posted projects). I’m really keen to understand how to fix these. Please kindly let me know if you’ve discontinued support for 1.7.x customers. Thanks! Regarding your problem, our TS sent the email for you. Kindly check and ask me if there are any issue. Hi there, do you still support old customers or do I have to repurchase? Submitted 3 tickets and sent 2 emails but I didn’t hear back. I have a lot of questions with regards to this upgrade. Need your support urgently. Thank you! Sorry for the late support. Since lots of tickets are sent a few days ago, your ticket is resolved later than usual. Thanks for the steady update. I already have a lot of customizations, so I need some annoying works to update your theme. So I wont’ update this time. I’m planning to update only if there is a core enhancement. 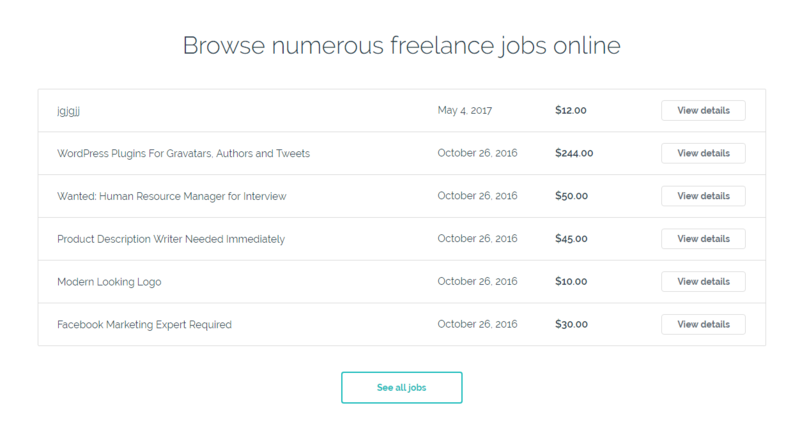 How long does it take to add [multi-freelancers for a project] feature mentioned above? A month, two months or a year? Please let me know the approximate expected time. Regarding your question about multi-freelancer, we cannot give you a timeline since we don’t sure to conduct this function or not. In fact, if we conduct this feature, we must change the whole the core, it can take us 1 year to do that. So, if you want this feature for your business, you should find another solution. But even with the new updates, the theme is still years behind other popular themes. The theme has been neglected and you know it. Regarding your questions, could you send us a ticket by choosing Basic Questions section at https://www.enginethemes.com/help/? Our CS will answer you ASAP. hi again. simple question here. i am not able to change the footer logo image. could someone help me with this asap please. thanks alot. Regarding your question, please send us by choosing Technical Problems at https://www.enginethemes.com/help/. Our TS will guide you how to change the footer logo image. Hi Thao, thanks for your quick response. but i did create a ticket 6 days ago and still have no response. so please this is a simple request. I just need to replace your logo on the footer with mine. Regarding your question, you cannot replace your logo footer in FreelanceEngine 1.8. However, we fixed this problem in FreelanceEngine 1.8.1. I was able to change the footer image by modifying footer.php. On line 50, there is a link an anchor tag that references the EngineTheme logo image (logo–fre-white-footer.png). Change it to reference the image of your logo and also site. Note: if you make this change, this will hard code your logo in the current version of the theme. When it gets upgraded in the future, this file would be overwritten. I just noticed I could not upload html/php code. Anyhow, here is an image of what I changed in footer.php to change the logo. FreelanceEngine 1.8.1 will be released in the next few days. In this upcoming version, we’ll resolve some bugs you meet in the FrE 1.8, including logo footer modification. Hi there, when going on to purchase the theme it says V 1.7.13? I thought 1.8 is now relesed? Also, is it possible to integrate PayPal payments with the basic version? Also, the PayPal payment gateway is integrated into FreelanceEngine basic. So, this PayPal is seamlessly displayed as the default method on your FreelanceEngine site. First, Great upgrade. I love the new features. After upgrading to F1.8/FrE Stripe/FrE Stripe Escrow my site will no longer release fund to the worker when the Employer marks the work as complete. In previous versions I had no problem. The site appears to still be able to interface with Stripe (as it does properly charge the Employer when they accept the bid). Looking at the Stripe logs shows the money is properly put into escrow, but no calls (or errors) are shown when the project is marked as complete to initiate the transfer to the connected accounts. To handle current projects going through the site, I have been manually calling the Stripe transfer API via CURL (after the project is marked completed), but operating in this manner is not convenient. My stripe account is set up to use API 2017-02-14. Is that ok? Or should this be updated? Please help at your convenience. I have opened a support ticket. We sent you an email regarding the problem you mentioned in your support ticket, Kindly check your mailbox and contact me if you have any further problem. I had bought this theme but where is my theme file now ? once it over 12 months you guys deleted the theme file from my download area . This is not good . you should keep last version after 12 months gets over in my profile for lifetime . Regarding your question, I’ve checked your account and found that your license for FreelanceEngine was expired on August 03, 2016. It means you can use FreelanceEngine for your website without any problem, but you cannot keep receiving updates and our support for it if you don’t renew your license. That’s why you cannot access to your member area to download the latest version 1.8. We sent you an email on Jul 27, 2016 related to this problem, kindly check your mailbox and reply us if you want to renew your license with 50% off of the original price. Hope it classifies your questions. What a mess. I had nearly finished a project with your site. The client now wants the updated features but it’s impossible to update the old site as the styling is completely different, the settings are less comprehensive and you can’t use visual composer. This is a step backwards. As we mentioned in this post, we decided to change the whole UI design of FreelanceEngine since we are planning to conduct more features for FreelanceEngine in the future. But it’s really hard for us to implement these features based on the previous version. It can be said that FreelanceEngine 1.8 is the first step in the process of developing our theme later. We are working on the new updated version with the most elegant UI and logical UX to resolve the problem you’re encountering.